Stump removal in Didsbury can cause a lot of headaches for the inexperienced. This is why you want to have professionals on the job. 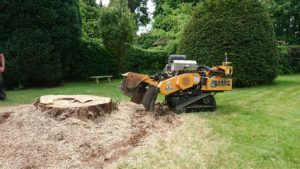 With more than 25 years of experience, Wainwright Stump Removal have been providing unparalleled services in the Lancashire, North Wales, Manchester and Cheshire areas. Besides stump removal, our services include site clearance, log and briquette delivery, tree work and tree planting. We have developed a reputation for quality, professionalism, integrity and efficiency. Fully certified with all relevant NPTC certificates and fully insured, Wainwright Stump Removal have the documentation to prove their dedication to quality service and professionalism. In Didsbury, stump removal from Wainwright starts with a quick quote. To receive this quote all you have to do is measure the diameter of the stump and mention its position when putting in the call. The position refers to whether the stump is on open ground or adjacent to a fence or wall. A photograph would be even better! Next you want to measure the access to the site, so we can estimate which equipment can be used most efficiently. The final detail that would help to make the quotation as accurate as possible is the tree species as hardwood and softwood stumps are handled differently. Once you receive and accept your quote for stump removal in Didsbury, we will set up a date and time, After that it’s go time. We will send in the machinery and experienced operators to handle the job. The process itself starts with the placing of a perimeter guard which prevents the spread of the wood grindings. We can remove stumps of up to 600mm below ground level. The resulting grindings may be used to fill in the cavity left behind and any extra grindings can be used as mulch. If you want the grindings completely removed from your property please inform us as this process incurs an extra charge. To find out more about the prices for stump removal, contact Wainwright Stump Removal today.